Tatsuki Machida of Japan won his first grand prix gold at 2012 Cup of China. It was as eventful figure skating competition in the Men’s discipline at the 2012 Cup of China, and it ended with a big surprise when little heralded Tatsuki Machida beat Daisuke Takahashi to lead the Japanese men to a one-two finish. Sergei Voronov of Russia earned the bronze medal. Less than one minute into the warm up of the second group, USA’s Adam Rippon and China’s Nan Song crashed into each other head first. While Rippon got back up quickly, Song did not. He lay on the ice, covering his head, and it seemed like forever before the other skaters realized it. Voronov skated over and tried to help him before the referee finally blew the whistle and stopped the warm up. The four men left the ice as event staff escorted Song off the ice. The warm up resumed a few minutes later, and Song was taken to the hospital and diagnosed with a concussion. According to Chinese officials, he started to feel better, but stayed in the hospital over night for observation. Rippon then had to skate first. Performing to music from the The Incredibles, the former U.S. Junior champion popped his opening Axel into a single, but went on to land a triple Salchow and loop, as well as a triple Axel after the half-way mark. Two more triples followed, however, he stepped out of a cheated triple Lutz. He finished fourth with 133.6 (761.81/71.86) and remained in fourth overall with a total score of 205.48 points. The 22-year-old felt that the accident in the warm up affected his performance. Voronov was up next. He nailed a quad toe right out of the gate in his Romeo and Juliet program, as well as six triple jumps and level-three spins and steps. The former Russian champion scored 144.03 (73.59/70.44) points for an overall score of 217.61 points. Voronov said he was badly shaken by the incident in the warm up. 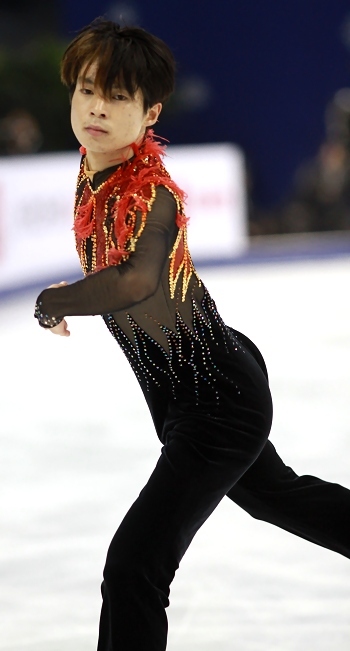 Machida performed to The Firebird by Igor Stravinski and produced a triple Axel, a triple Lutz-triple toe, as well as four more triples, but he went down on his quad toe. The program is well constructed and interesting to watch. With 153.44 (76.66/77.78) points for the free skating, and 236.92 points overall, the 22-year-old moved up to the top spot on the podium. With his bronze from Skate America and the gold from China, Machida leads the Grand Prix standings and is almost guaranteed a spot. Leader Takahashi skated last. He tried two quad toes, but the first was cheated and the second was underrotated. The World silver medalist recovered to hit four clean triples, including an Axel, but he missed an underrotated triple loop. Four level fours for the footwork and spins helped to bring his score up to 146.96 (65.30/82.66) points, but it was not enough, and he fell behind Machida with a total of 231.75 points. Canada’s Kevin Reynolds landed a quad Salchow and three clean triples, but he wobbled on the triple Axel-triple toe and fell on a double flip. The Canadian placed fifth at 202.07 points. Brian Joubert of France withdrew during the morning practice due to illness (abdominal pain and fever). Coach Annick Dumont added that he fainted three times during the flight. The Frenchman changed his plane ticket and planned to leave Sunday morning. He wanted to return home to Poitiers and see his doctors.